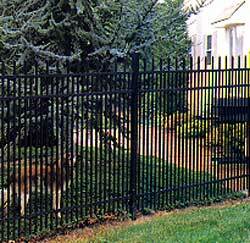 The Aluminum Fences pictured here have a distinctive appearance that will complement any home. 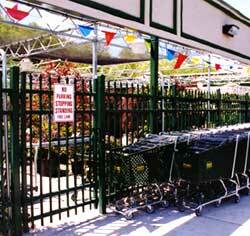 Aluminum fences offer the attractiveness and protection of traditional wrought iron fencing without the maintenance. They are available in a wide variety of styles, colors, and heights that add prestige and value to any property. 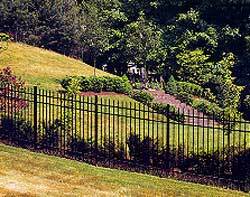 No other fence will do so much to enhance the beauty of your home, pool or yard. 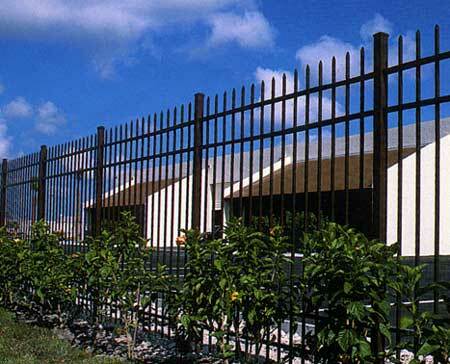 These fences are constructed of an exclusive high-strength aluminum alloy called HS-35 This remarkable material has the strength of steel, but will never rust or corrode, even in coastal areas or around swimming pools. Plus, the durable powder coated finish is guaranteed not to crack, chip or peel for as long as you own your fence. Our polyester powder coating, called FencCoat TM is an environmentally safe, high quality alternative to paint. When applied, FencCoat is twice the thickness and hardness of a typical painted finish. It is far more durable, fade-resistant, and scratch resistant than other coatings, which is why we can give a Lifetime Warranty on our finish. #100 - Modification of Style #101 with staggered picket tops for something a little more distinct. 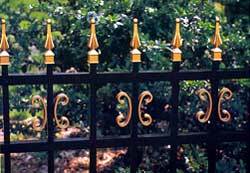 #101 - This traditional wrought iron design has its points even across the top. #111 - This version of Style #101 is built to accept Imperial or Majestic finials on the pickets instead of the standard spear points. #301 - Similar to Style #101 but with a 1-5/8" space between pickets. This fence will keep most pets in your yard. The narrow spacing also makes it difficult for children to obtain a foothold on the fence.